"Who am I?" is the title given to a set of questions and answers bearing on Self-enquiry. The questions were put to Bhagavan Sri Ramana Maharshi by one Sri M. Sivaprakasam Pillai about the year 1902. Sri Pillai, a graduate in Philosophy, was at the time employed in the Revenue Department of the South Arcot Collectorate. During his visit to Tiruvannamalai in 1902 on official work, he went to Virupaksha Cave on Arunachala Hill and met the Master there. He sought from him spiritual guidance, and solicited answers to questions relating to Self-enquiry. As Bhagavan was not talking then, not because of any vow he had taken, but because he did not have the inclination to talk, he answered the questions put to him by gestures, and when these were not understood, by writing. As recollected and recorded by Sri Sivaprakasam Pillai, there were fourteen questions with answers to them given by Bhagavan. 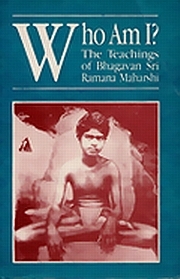 This record was first published by Sri Pillai in 1923, along with a couple of poems composed by himself relating how Bhagavan's grace operated in his case by dispelling his doubts and by saving him from a crisis in life. 'Who am I?' has been published several times subsequently. We find thirty questions and answers in some editions and twenty-eight in others. There is also another published version in which the questions are not given, and the teachings are rearranged in the form of an essay. The extant English translation is of this essay. The present rendering is of the text in the form of twenty-eight questions and answers.